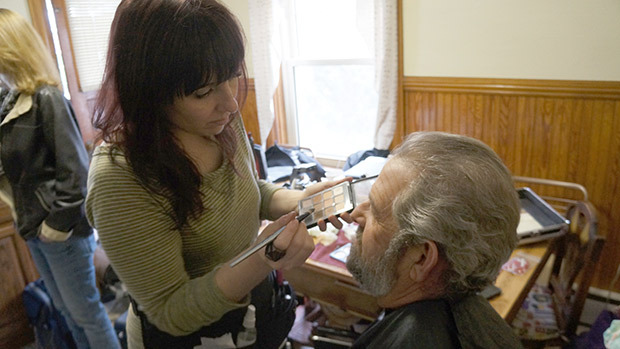 Maya Landi is Boston-based hairstylist and makeup artist who works on everything from weddings and music videos to horror films. I talked to her recently about her work, how to age characters and how to create a head-shot effect, during the shooting of a music video for the band Run 8 Rider. Filmmaker: What have you been doing for this project? Landi: One of the characters plays a grandfather and a father in different eras in time. I had to do some aging makeup for him, as well as make everybody look appropriate for the era that they are supposed to be in. There are some things set in the 80s, some things set in the 60s. Filmmaker: What kind of things did you do to make them look right for the different eras? Landi: For the daughter coming home from college in the 80s I did a little bit of a blue eye-liner, some brighter blush, and teased her hair a little bit because the whole idea was that she had left a small town, gone to college in the city and was starting to embrace that style. Filmmaker: How do you age a person? Landi: One of the techniques to use is to take a color that is a few shades darker than someone’s skin tone and very finely fill in the lines in their faces. You have them make different facial expressions to create different lines. To fill in the lines on the forehead, you have someone raise their eyebrows; to create crow’s feet around the eyes you have them smile and squint really hard. You try to create shadows on the face, try to do some concave shading for what would happen during aging; things start to sink in a little bit, so you create that with balances of light and dark. Filmmaker: What sort of horror effects have you created? Landi: A lot of zombies, a lot of injuries with prosthetics. Filmmaker: How do you create injuries? Landi: Lots of wax, lots of liquid latex, it depends on what you are trying to do. There was one scene in a movie where I had to actually come up with a death scene for somebody when she got shot in the back of the head. We set it in an area where she was running towards a doorway. There was a big white wall in front of her so all you see is her getting shot from behind, but her face sort of explodes on to the wall. The film had a very low budget and because we did it last minute we tried to utilize what was there. I just added bits of bread — regular white bread — bagel, some bits of old dried latex and torn up pieces of used baby wipes that I was cleaning the fake blood off of my hands with to create different textures that were similar to bone and flesh and brain. We had a pressurized canon and we filled that with the mixture along with some fake blood and at the time of the gunshot it exploded and because of the different textures some things stuck to the walls, some slid, some bounced off, which would have happened with the combination of bone flesh and brain. And then I go and I do a wedding!